This is the stage and a bit of our competitor meeting before the show. 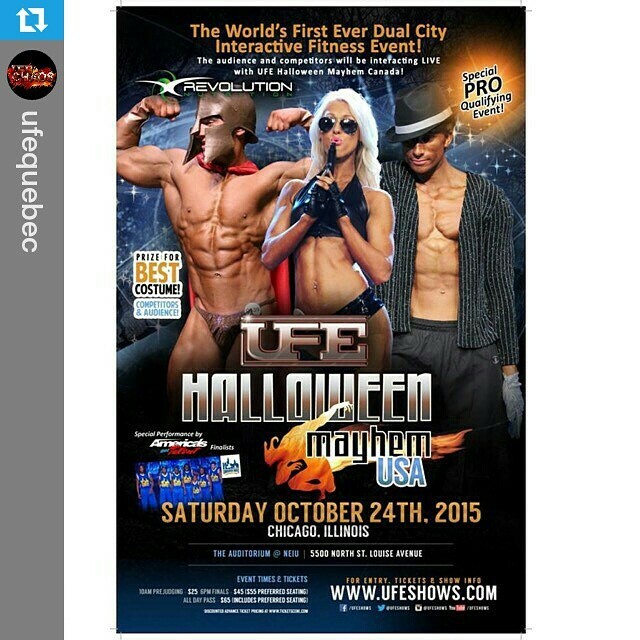 I competed in Masters Bikini at the UFE Halloween Mayhem at Northeastern Illinois University (NEIU) in Chicago. This was really one of the best shows I’ve done. I enjoyed it very much. It had a Halloween costume portion also. Unfortunately, I was confused on that and didn’t bring one. The girls at Fitworld Tan created a costume for me on the fly so I wouldn’t look like total jerk. I am grateful. The mister and I left the hotel and headed to the venue. I’m rocking my Team Sleek tank! Representing my girls. We are over 100 strong all over the world! Heading into the venue with my lucky suitcase, 6 pack cooler. I’m ready. The green room for this show.. OMG. It had lighted mirrors. It was nice and big and it had a bathroom for us as well. Best venue to date! The promoters had water and cookies for us too! We went straight into our meeting. Our meeting took place on the stage. This stage was FANTASTIC. After our meeting my group was called to line up. Unfortunately, I did not get glued into my suit before I went out on stage. That was a bummer. I did my best to get something down but time didn’t permit. For Masters Bikini the age range was 35 and up. I am 50. 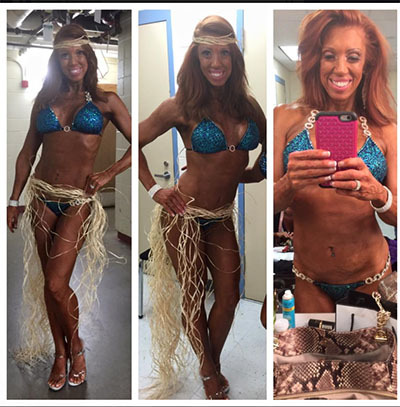 I am the oldest bikini competitor in this show. We did a T-walk in the pre judging and waited on the pink line behind me. We walked to the front of the stage. We went through a very quick round of quarter turns. Then left the stage. This was the fastest judging I’ve ever done. We were off the stage and I was actually done until the night show. The night show was really fun. I did not place in the top 3 for this show. I’m very happy with the package I brought to the stage. I weighed 131 pounds on stage. I’m 5’8″. I have not weighed this little since I was 11 years old. 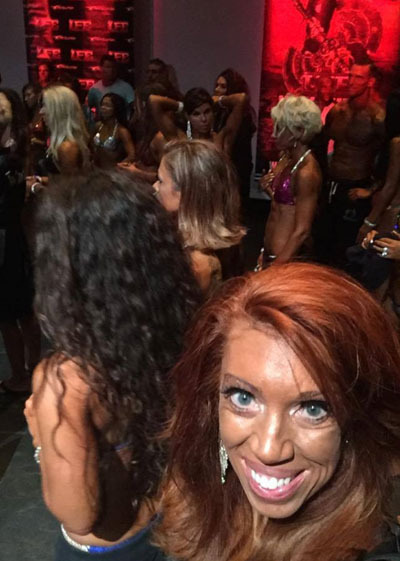 I think everyone thinks you look huge on stage but competitors are actually itty bitty. I worked for 16 months to be in this show. I did my best! The thing I focused on was to improve my physique from last season. I definitely did. I am self coached and IIFYM. My last shows were Bro and I was miserable. I will say that I had the best prep I’ve ever had. I learned so much! I have already begun working on my 2016 game plan. I wish you luck in your shows!! Thanks to UFE for having me. The mister and I woke up early Friday the 23 and began our 5 hour drive to Chicago. The trip took 6.5 hours because of all the peeing I had to do. It’s all good. We have never traveled for a show before. 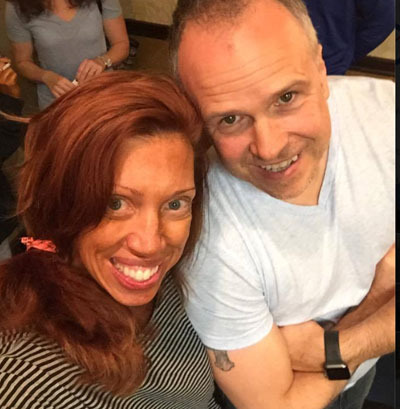 I would typically recommend you stay at the host hotel simply because the tanning and makeup vendors would be on site as well as your Friday night check in. Often the Polygraph testing is at the host hotel as well. They will often have a good rate for you. They will also give you instructions as to what to bring to protect the hotel property from your crazy tan. We brought our own sheets. I’ve been super fug all week. Prepping my skin and rarely in makeup. I was exhausted when I got to the tanning appointment. 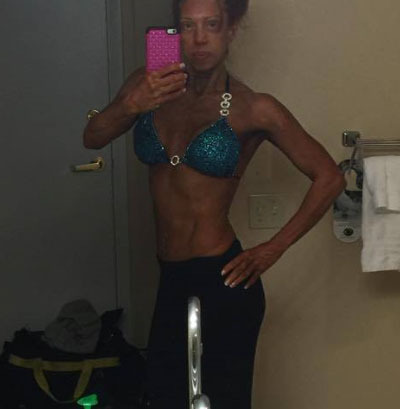 I liked the girls at Fitworld Tanning a lot. They were very cool to me all weekend. Tanning takes a good hour or more. You’re naked and people will be walking around you. If you can tan at the venue, that’s a great idea. Your tan makes a difference in your overall appearance. Fitworld also did my hair makeup so I just purchased the entire package. I worked 16 months to do THIS show.. I wasn’t going to skimp on anything. Our check in was easy! We met our show’s promoters and got our numbers. Super great people! Excited to do this show!! The mister. Man.. he just helps me so much. By the time we were done with check in, I passed out and he went to Kuma’s Corner for a burger. Early am on Show day!! I woke up feeling lean and tight! Ready to get down to hair and makeup!